Tens Of Thousands Of Alpacas Die In Peruvian Cold Snap : The Two-Way Peru's government has declared a state of emergency in the southern Andes, where brutally cold temperatures have killed the animals and threatened farmers living at high altitude. Agustin Mayta Condori shows a sick alpaca, which he predicted would die the next day because of subfreezing temperatures in the southern Andes in Peru. Thousands of alpacas have died in the region. The government of Peru has declared a state of emergency in the southern Andes after brutally low temperatures killed tens of thousands of alpacas, according to The Associated Press. The government is promising $3 million in relief to farmers in the region, who live at or around 15,000 feet above sea level and raise the animals, relying on money from selling their lightweight wool. In early July, Reuters reported crops were ruined and animals were dying of cold and hunger as snowstorms moved through the mountains. This week, the temperature has dipped as low as -4 degrees Fahrenheit, the AP reports. July is the coldest month of the year in the southern Andes, with an average July temperature over the last 15 years around 20 degrees Fahrenheit. "Peru is the world's largest producer of alpaca wool, an almost silky natural fiber coveted by the world's top designers, and has about 4 million of the camelids. But in stark contrast to the high prices charged by the likes of Armani and Gucci is the daily struggle against the elements and poverty by the thousands of shepherds whose livelihood depends on the trade. 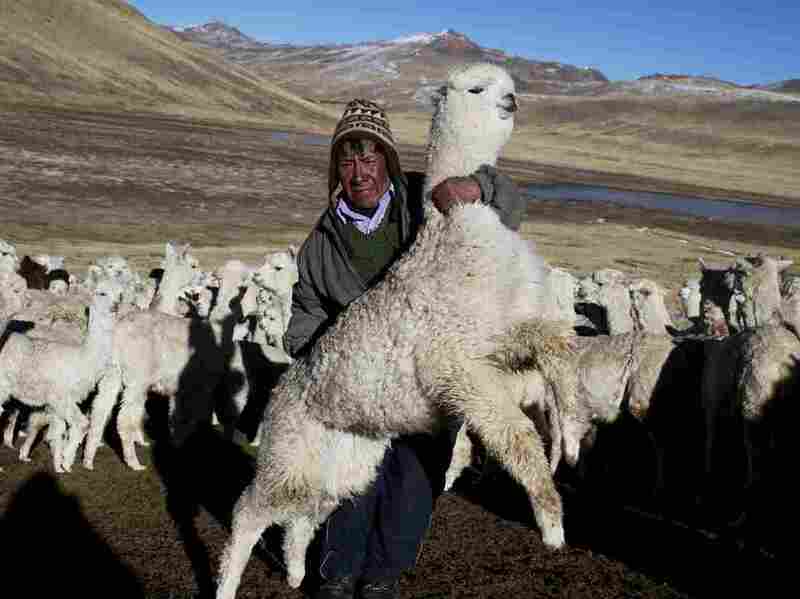 "The high-altitude rural hamlets where alpacas have been raised for centuries are among the most-deprived in Peru. The more than 120,000 families that make a living from shearing the soft, featherweight fiber earn as little as $1,200 a year, which works out to less than half of Peru's minimum wage." 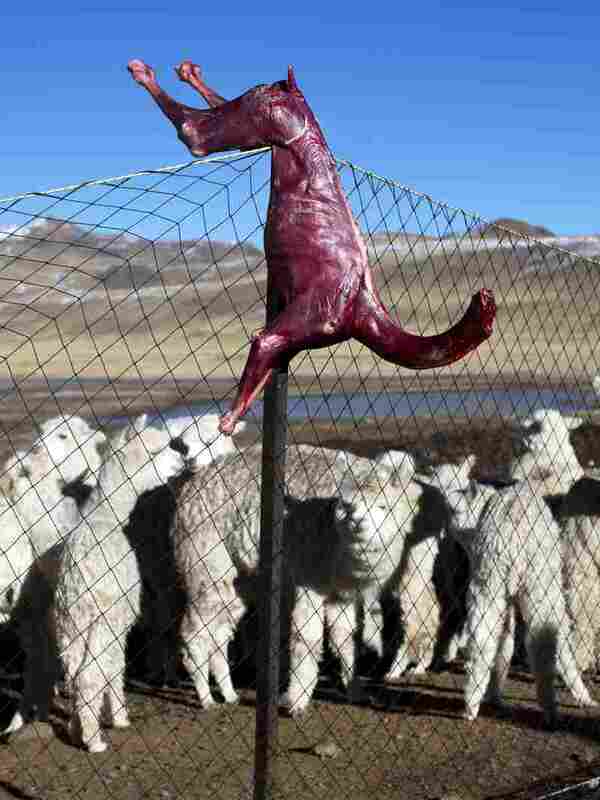 A skinned alpaca, which died due to subfreezing temperatures, hangs on a fence above live alpacas in Peru. Alpaca owners are butchering their dead animals to cook for their families. The Peruvian government has declared a state of emergency in the farming regions where alpacas are raised. Alpacas give birth to only one offspring each year, according to the International Alpaca Association, making it difficult for herds to recover from the loss of so many animals. The cold is also dangerous, even deadly, for people living in the high-altitude farming communities, reports the English-language newspaper The Peruvian Times. The Associated Press reports that in the past two months, an estimated 14,000 children — most of them in the southern Andes where alpacas are raised — have had respiratory illnesses because of inadequate home heating, according to government figures. This is not the first cold crisis the region has suffered in recent years. In 2013, the Peruvian government declared a state of emergency after record cold and snowfall killed thousands of livestock, the BBC reported. A 2014 United Nations report warned that climate change would lead to greater fluctuations in temperature in Peru, and more drastic weather events including droughts, which destroy grazing areas and weaken livestock.